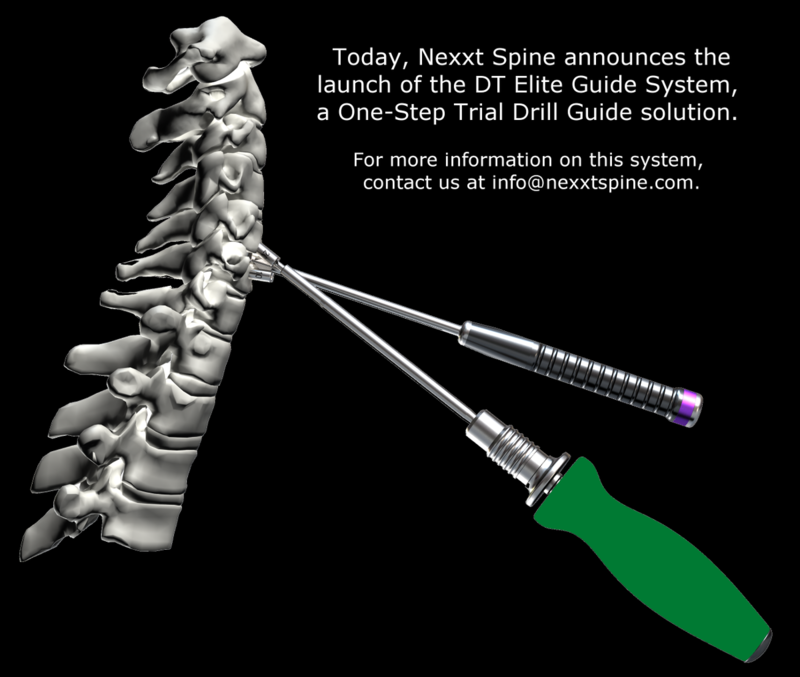 NOBLESVILLE, Ind.--(BUSINESS WIRE)--Nexxt Spine, LLC, founded in 2009, a privately held medical device company dedicated to increasing procedural efficiency and patient outcomes through development of innovative products, manufactured on the most technologically advanced platforms, and utilizing irreproachable quality standards to treat painful and debilitating spinal pathologies, today announced the launch of the DT Elite Guide System. DT Elite Guides reduce the number of operative steps during an anterior cervical discectomy and fusion (ACDF) procedure by allowing the surgeon to determine the appropriate interbody dimensions and prepare screw pilot holes for the anterior cervical plate simultaneously. The new guide system bridges the gap between the well-received Struxxure Anterior Cervical Plate and Honour Cervical Interbody systems. Nexxt Spine’s DT Elite System is manufactured to exacting specifications utilizing modern 3-D printing technology and is compatible with the Struxxure Anterior Cervical Plate and Honour Cervical Interbody systems.